There may be some of you who don’t appreciate the more satirical pieces of work on his blog, but don’t let that stop you from catching up on the REAL REPORTING Bill “pressdog” Zahren has been doing over at his site lately. It's enough to make a fellow blogger shed a manly tear. Check out some of these recent wire-worthy works, and in doing so you may in fact learn something. This weekend pressdog is ON SITE in Kansas, so expect him dial up the race coverage an extra notch. 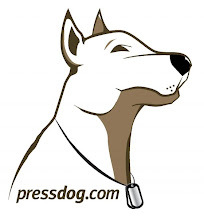 Just go to www.pressdog.com and hit refresh every few seconds like me. Trust me, it won’t hurt your computer one bit, and I guarantee his site is more stable than IndyCar Timing & Scoring.